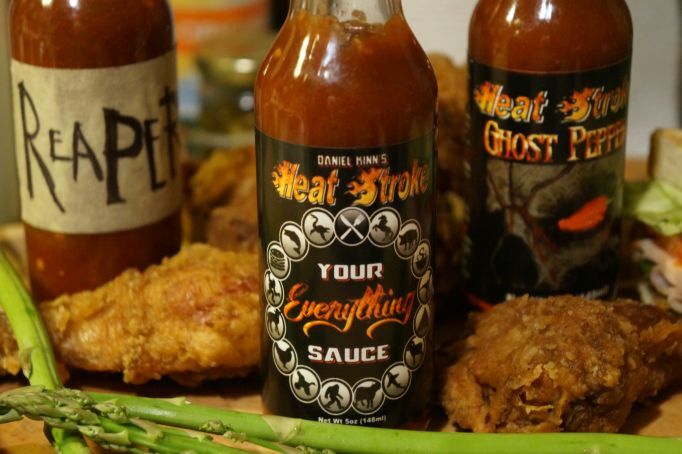 Local saucier Daniel Kinn's Heat Stroke Hot Sauce will not be forgotten anytime soon because the burn lasts for quite some time. I recently put some of his Reaper sauce on my eggs, trying to wake me up after a long day of getting the car repaired, and let me tell you, it stuck with me for most of the day. Not that was a bad thing, far from it. In fact, it kept me going reminding me that waiting at home was some of the last batch of the stuff that he made. So we would have to use it very sparingly which is tough because his stuff is crazy good. I met Daniel at our favorite bar a while back and after we exchanged information, he sent me one each of his Heat Stroke product line: Your Everything Sauce, Reaper and the shuddersome Ghost Pepper variety. We tried each one and were seriously impressed with each option. It was then I knew I had to do a Tucson Homeskillet on him and the sauces. Your Everything Sauce: This stuff was right up there with Frank's, Sriracha, most Tobasco products and anything from the Big Daddy line. You could, no joking, use this sauce on most of the whatever you put in your mouth. It made wings a bit brighter, pizza stronger, eggs cluck a bit, starches roar and fish and fowl rise to the occasion. Decent heat, slight linger of chilies and tomato and all around a perfect blend. Reaper: The funny thing about the reaper option was that he hadn't made a label for it yet so I just used tape and a Sharpie to identify it as such. This potion is/was quite nasty (in all the best sense) and the heat from this really dragged you down a stroke and left you bleeding on the asphalt. I love(d) it. Just a drop or two to any marinades, mixes and sauces added a bit of smoky sinister leaving your palate asking for more, only because your tongue has been naughty and needs a good spanking. Lil Poundcake: "And its great on cat food too!" Who knows, maybe in the future he and Heat Stroke will be back and we can all celebrate once again this amazing product. In the meantime, we're happy to have what we have from him and it and for that we all say thanks for the burn. Twisted Sister, "Burn in Hell"